Sephardic Chief Rabbi Yosef calls prayers to show defiance after stabbing attack, urges Jews to turn out at site in demand for security. Following the murder of two Jews and wounding of two others in Jerusalem's Old City by an Islamic Jihad terrorist, Sephardic Chief Rabbi Yitzhak Yosef called on Jews to turn out to the Kotel (Western Wall) not far from the site of the stabbing, to pray and show resilience in the face of the terror. 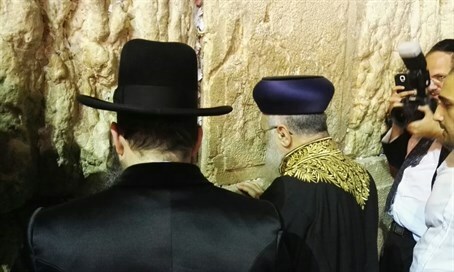 Rabbi Yosef, who was joined at the Kotel by Kotel Rabbi Shmuel Rabinowitz, wrote in his call for attendance: "the situation in which the blood of Jews is spilled like water in the land of Israel, day after day, when their only sin is their being Jews, is unbearable." "I call on all those who can to come tonight - the night of Hoshanah Rabah - and tomorrow, on the Simchat Torah holiday, to the Western Wall, to perform the commandment of the holiday and to pray for the peace of the wounded." "We can't allow a situation in which Jews are afraid to go to the Western Wall," continued Rabbi Yosef. He called on "all the sources involved in the matter to bring about a situation in which Jews will feel secure in all parts of the land of Israel." The prayer rally at the Kotel comes in parallel to mass protests near the Old City's Yafo Gate, and a tent protest started by Samaria Regional Council Head Yossi Dagan in front of the Prime Minister's Residence in the capital.